Washington, D.C., May 21, 2015 – Today the Alliance for Aging Research released a new volume and factsheet focused on cancer in its Silver Book®: Chronic Disease and Medical Innovation in an Aging Nation series. While the lifetime risk of developing cancer is around one in two for men and one in three for women, older people shoulder most of the human burden of this disease. Close to 80 percent of all diagnoses are made in people over the age of 55. 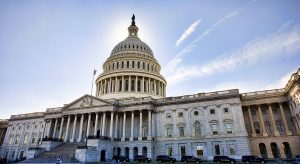 The Silver Book®: Cancer was unveiled by the Alliance at a Capitol Hill briefing in partnership with the Personalized Medicine Coalition (PMC) and the American Association for Cancer Research (AACR). Clarke and Susan Peschin, MHS, president and CEO of the Alliance offered remarks at the briefing. Daryl Pritchard, Ph.D., vice president of science policy, PMC; Harvey Jay Cohen, M.D., professor of medicine and director, Duke University Aging Center; and well-known speaker, author, and producer Beverlye Hyman Fead also spoke. The Silver Book® has become a trusted resource for policymakers and thought leaders interested in public policy that helps older Americans live in better health. 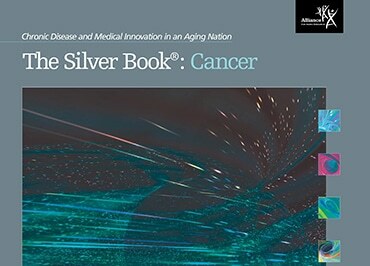 The Silver Book®: Cancer was supported by an educational grant from Pfizer. For more information, please contact Noel Lloyd, communications manager, at 202.370.7852 or through email.